Rapunzel’s Royal Table will open for guests this evening during this first cruise following a 2-week dry dock. According to DCL, Rapunzel’s Royal Table is an immersive family dining adventure with a fabulous fairytale twist. The experience is a fantastical epicurean journey with Rapunzel and the gang from Tangled! Guest are presented with an enchanted evening filled with food, music and interactive mealtime fun at Rapunzel’s Royal Table, the first restaurant inspired by Disney’s hit animated feature. Guests are invited on a delicious trip to the faraway kingdom of Corona, where King Frederic and Queen Arianna are celebrating Rapunzel’s birthday and the anniversary of her return home. Step inside the royal ballroom, where glowing wish lanterns illuminate your path and the walls are adorned with colorful drawings reflecting Rapunzel’s artistic endeavors. Throughout dinner, Guests will be treated to lots of lively entertainment—from singing and dancing with our merry band of musicians to appearances by the mischievous Snuggly Duckling Thugs and Princess Rapunzel herself. Families can join the festivities, which includes a spirited parade to cap off the night! Thanks to Jamie Cash, we have a first look at the all new menu for Rapunzel’s via screenshots of the Navigator app! A typed up version will be available on our menu page. 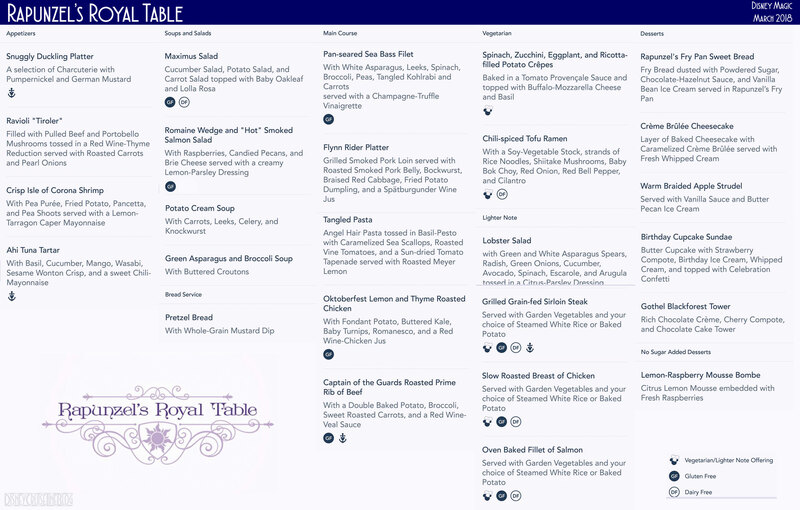 This entry was posted in Menus and tagged Disney Magic, Rapunzel's Royal Table by Scott Sanders. Bookmark the permalink. Oh my! Lots of tough choices there …. I would perhaps have to ask for one of everything. You are right! Everything sounds wonderful! I feel that on the “Name” of this menu will be German, as this is what a lot of these items sound like. Looks like that night is curry night. It sounds like this is meant to be an immersive and interactive experience that’s analogous to Tiana’s Place on the Wonder. I agree that it would be hard to make dinner choices with so many yummy things on the menu. I’d love to hear some item reviews from someone who’s dined here.